Sean O’Brien is widely acknowledged as one of the most gifted English poets now writing, and as a leading poet-critic. Cousin Coat collects the best of O’Brien’s work to date; long-time O’Brien aficionados will be grateful to have so much of the early work available again, while recent converts will be delighted to find that O’Brien’s boisterous wit, intelligence and astonishing technical fluency were as much in evidence at the outset of his career as they are now. While some of O’Brien’s mises en scène and dramatis personae have remained constant over the years – the urban dystopia, the train, the rain, the underground, the canal, the lugubrious procession of conductors, policemen, head teachers and detectives – their shadows have deepened with O’Brien’s sense of their historicity and mythic power. His imaginative landscape has become impressively varied: as well as blackly paranoid fantasy and scabrous political critique, O’Brien’s work now encompasses English pastoral, comic set-piece and metaphysical lyric, and shows a growing fascination with song-form and dramatic verse. 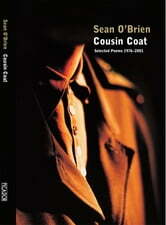 Cousin Coat represents the best introduction to one of the most significant English poets of the last thirty years.